You’ve been using Facebook for several years now and all of a sudden you have this brand new Google+ account, but all of your picture libraries are attached to your Facebook account…what do you do? Have no fear…as they say, there’s an app for that! The team at Dropico have come up with a pretty slick, super simple, 99¢ app (appropriately named) Google Plus Photo Importer, that quickly lets you import your photo libraries not just from Facebook, but from Flickr, Instagram and Photobucket as well, directly into your Google+ account. You simply launch the app, log into your various accounts and accept the obligatory “allow Dropico to access your information” warnings and you are ready to start importing. It’s just that easy! Since I do not tend to use Flickr, Instagram or Photobucket, I focused on the Facebook importing feature of the app, but the idea is the same for each of these services. Using icon-shaped thumbnail images, you can select individual images or whole albums from your Facebook account, and then you are given the choice of whether to import these into an existing Google+ Album, or create a new Album. If you decide to go with the new album, Google Plus Photo Importer is nice enough to pre-fill in the new Google+ album name with the same name as the Facebook Album. Once you’ve made your selection, you tap the ‘Upload Photos’ button and things are off and running (at quite a nice clip). In fact it only takes about 40 seconds to import 100 pictures! 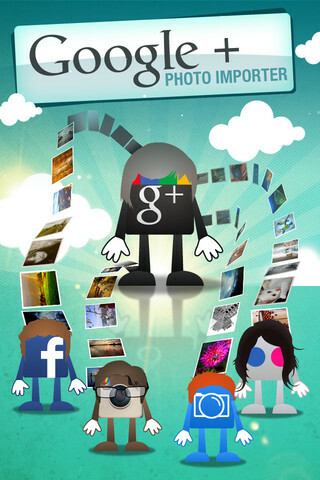 There is even a cute little animation of a Facebook icon guy handing off each photo to a Google+ icon guy. Any captions that you included on the photos while in Facebook are also transferred with the files, but unfortunately the tagging information is not. I believe this could be a limitation of the Facebook API, but even if it is not, I suspect it would be rather difficult to accurately map every Google+ circle member to an existing Facebook friend for proper tagging, so I cannot really fault Dropico for this. However, it is worth noting that when you import to a new Google+ album, that new album is automatically shared with “Public” permissions. I would have really liked to have had an option to decide what permissions the new album should have or at the very least, have the ability to upload the images, but NOT have them automatically shared. 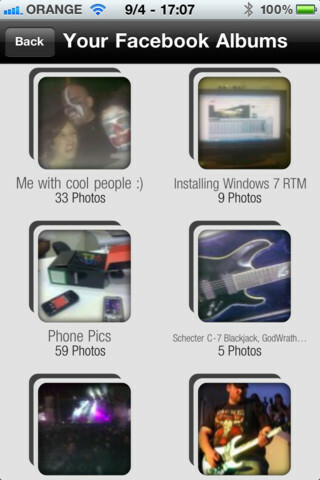 Google Plus Photo Importer does exactly what you’d expect it to do and it does it quickly. After the burden of the initial one-time account login dialogs, the interface is clean and simple to use. If you have the need to import your photos from Facebook, Flickr, Instagram or Photobucket into your brand spanking new Google+ account, I cannot imagine that there is a simpler or quicker way than Google Plus Photo Importer. At just 99¢ this app could potentially save you A LOT of time.